This lovely fitted bespoke study and storage was created for a client who initially only wanted a few shelves to go with an existing free standing desk and cabinet!! However, in this instance getting rid of the old pieces and replacing them with a fitted solution has worked really well. The room feels much bigger than it used to and works much better as well. Lovely oak grain is laid horizontally to highlight the design. Walnut plinths step out for the cabinets at the top and the base and the main desk surfaces are walnut. Additionally there are display shelves, feature lighting, wiring channels, the provision of additional power outlets and the computer printer is stored on a sliding try within one of the cabinets. Having failed to find a quality, stylish and contemporary solution to furnishing a study we approached Paul Case Furniture. Our requirements were thoroughly discussed, creative bespoke designs were then presented to us and a scheme was chosen. The attention to detail and personal service provided throughout, made the installation faultless. We have recommended Paul Case Furniture to friends who have also been delighted. 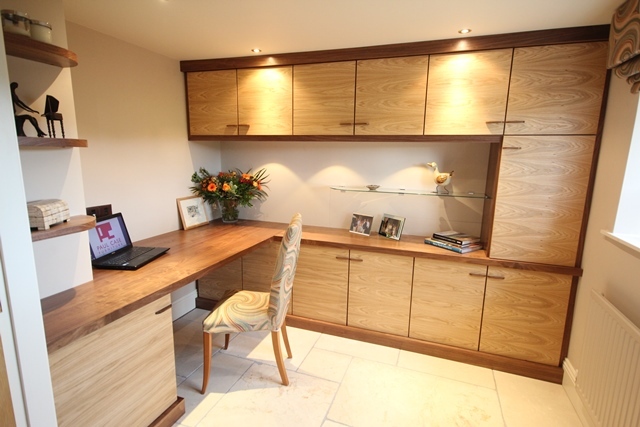 Home office furniture home study solutions are designed and installed all over the UK. Of particular focus is Lancashire, Cheshire, Yorkshire and Cumbria.